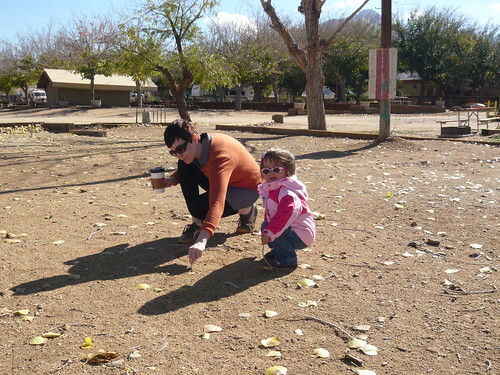 Mali Mish – Our first mini-road trip to Lake Isabella. Our first mini-road trip to Lake Isabella. 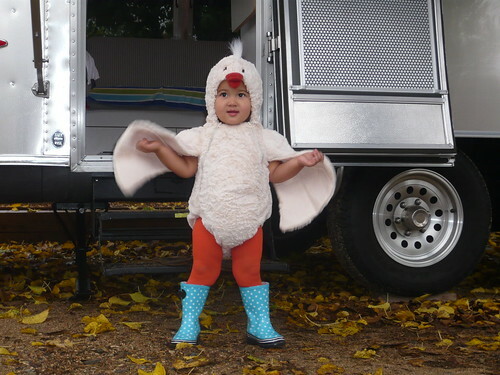 Just after taking Ava trick-or-treating for her first time around the neighborhood, we packed ourselves in the van and headed out of town for our VERY FIRST ROAD TRIP in the Airstream. Yeah! We decided to break up the drive into two parts, in order to make the drive more enjoyable for Ava, and therefore… for everyone. Just around midnight, we arrived at a Walmart that sits on the outskirts of Bakersfield. It’s not the “ideal” place for our very first night in the Airstream, not even close, but it was the most logically place to stop prior to heading up the winding road to Lake Isabella. Walmart is known for letting RVers spend the night in their parking lots. It’s a win-win situation for everyone. RVers get to boondock for free and Walmart usually gets their business… because who doesn’t forget to pack a thing or two for a trip. Not us. We weren’t really sure where we should park when we arrived. A helpful security guard was on the scene and gladly guided us to a private corner of the parking lot. 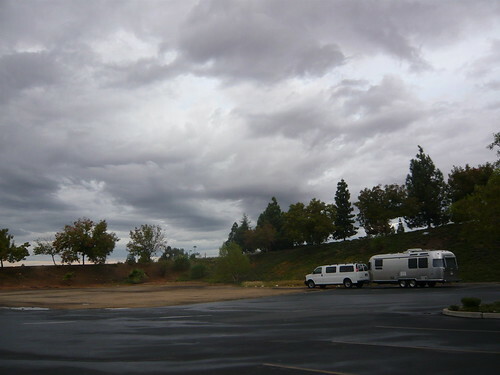 We decided to park just shy of the dirt patch designed for RVs due to the impending storm that was headed our way. 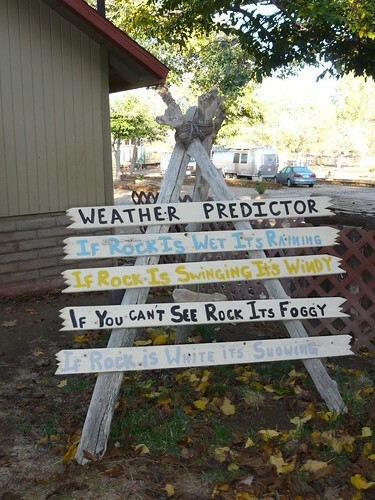 At 6am, we were awoken by a light drizzle. The sound of the rain on the Airstream made waking up just perfect. There’s nothing like sleeping in a warm cozy bed when it is raining outside your window. After a few minutes of drizzle, it started to pour outside. And on the inside? Well, on the inside it sounded like we were being bombarded by machine guns. Rata-tat-tat-tat! We planned to drive up the mountain once the rains let up a bit. So it off to Walmart to “donate” some money for some of their goods to thank them for the free camping site. I try my best to feed Ava a natural and organic diet, when at all possible. I even bring her own food and milk to daycare. Yes, she’s the freaky kid that eats the “weird food” while every other kid feasts on white bread and chicken nuggets. But on this trip, I didn’t have a chance to buy groceries and plan our meals ahead of time. So if we couldn’t eat healthy at the moment, why even try at all. 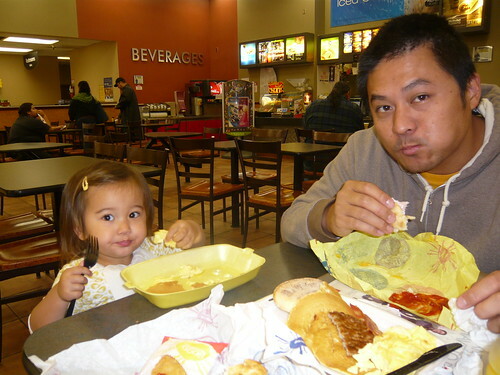 Here are Dan and Ava enjoying themselves at the McDonald’s inside of the store. The rain didn’t let up for a few hours. 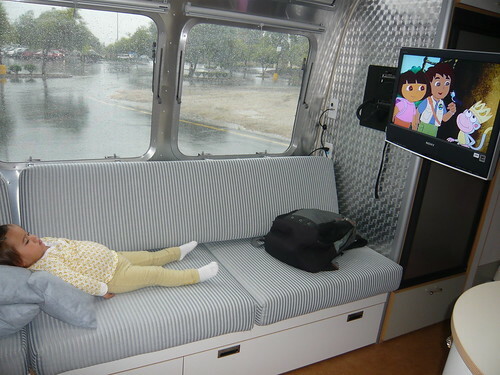 To pass the time, we popped in a Dora the Explorer DVD. Ava was loving life in the trailer. 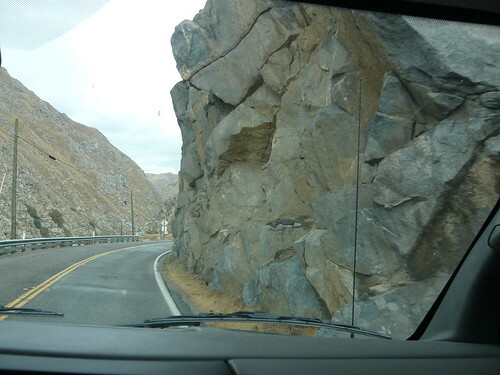 I was dreading the drive up the CA-178 up to Lake Isabella. Everyone and their mom was warning me about the scary drive. And was it scary? HELL YES but not as bad as I imagined it in my overactive scaredy cat imagination. There were huge rocks that we had to get really close to. There were small fallen rocks that we had to avoid. There were dirt turnouts that we had to drive into to allow others to pass us. But we made it safe and sound to Lake Isabella KOA. The back-in site that we reserved was flooded due to the rain, as they all were, so they kindly upgraded us to the best pull-thru site they had. Why the star treatment? Was it because they knew we were internet superstars (cough)? Was it because they knew we would be reviewing their facilities to a million-plus readers all around the world wide web (cough, cough)? Nope and nope. It was because we were the only crazies that decided to camp in the pouring rain on Halloween weekend. That’s why. But if we didn’t decided to be the crazy campers that we were, we would of missed the beautiful surroundings of the KOA campground. The angry storm above, the fluffy clouds hugging the mountains, and the dense vegetation made our Halloween weekend even spookier. 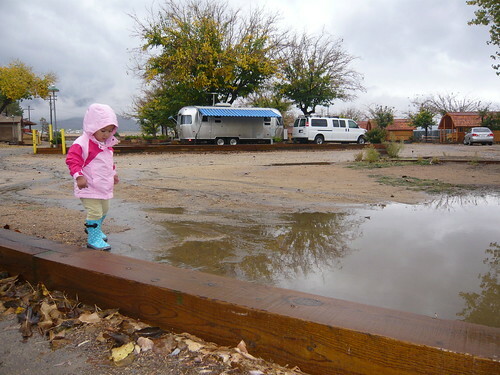 Camping in the rain with a toddler was not torture. Not when she has a brand new pair of turquoise polka-dot rain boots. Ava would of spent all day walking through the puddles if we let her. She was more than content with just walking through the puddles but I had the bright idea to show her how to jump in the puddles too. Ummm, bad idea. Especially when you bring a limited amount of clothes for the weekend. Some of my family members also joined us for the trip and were planning on tenting it. Tenting it in the rain is not the most desirable thing for most sane people. Luckily the campground had these cool little log cabins to rent out for the night. Ignore what is happening in the foreground. 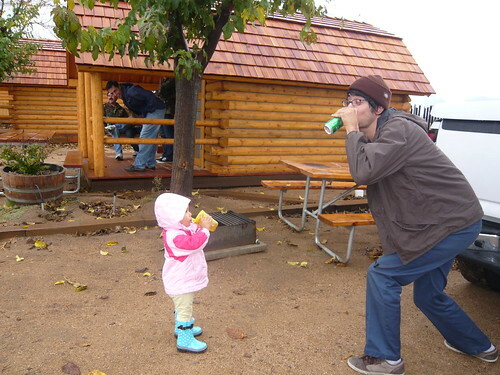 Ava and her Uncle David were having a “drinking contest”. And if you must know, Ava won. Shame on you if you thought otherwise. 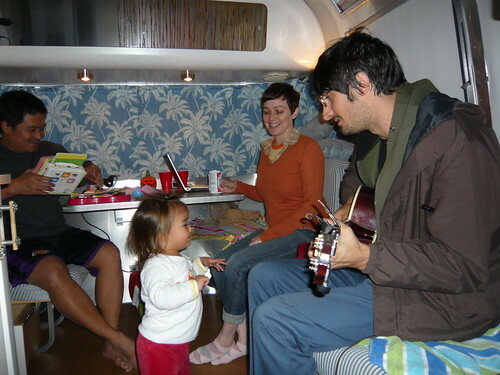 The KOA had lots of activities for adults and kids alike. Since it was a holiday weekend, Ava got to dress up once again in her chicken costume and join other dressed-up kids for a Halloween Party where she got to make Frankenstein rice crispy treats and decorate bags with bats and ghosts and glitter. Ava also had a blast picking up sticks and asking everyone around to draw her a picture of Dora in the wet dirt. Once her favorite character was drawn, she went down the list of cartoon characters until they were all drawn to her satisfaction. 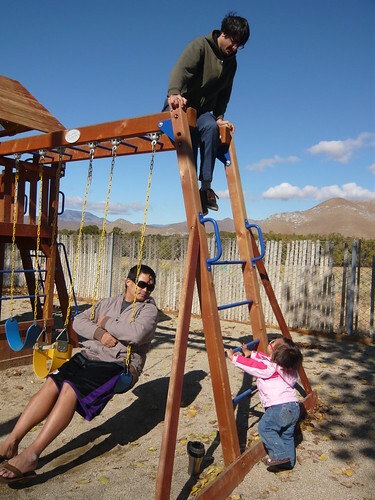 The campground also had a playground that was a big hit with Ava… and the adults alike. 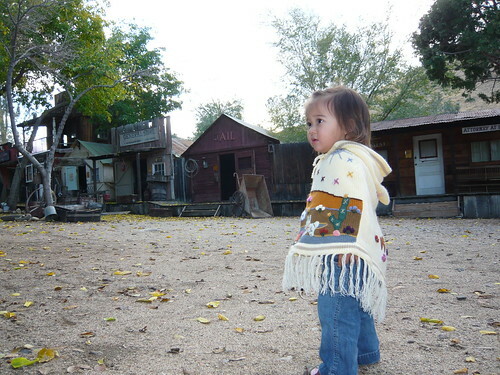 Just a few miles down the road is a small place called Silver City Ghost Town. We spent some time there taking a self-guided tour to look for some ghosts. I prepped Ava all day to alert us to any see-thru “people” that she might see with her uncanny ghost spotting abilities. You’ll have to come back in a few days for a special ghost post to see if she saw anything spooky. 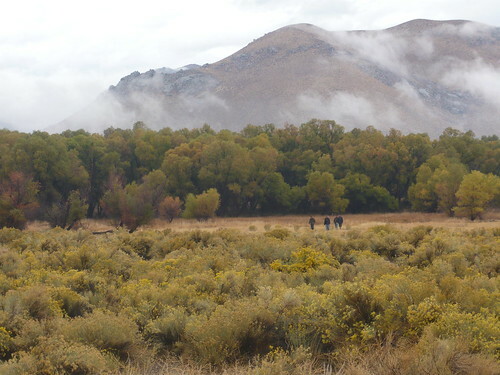 The rains finally let up on the second day of our adventure but were quickly replaced with strong winds. We woke up in the middle of night to the Airstream shaking from side to side. Poor Dan had to go outside in the middle of the night and put away the awnings so they didn’t end up back home before us. At night, we didn’t have a chance to hang out in front of a campfire but we did get to enjoy some beverages and music inside of the toasty Airstream. 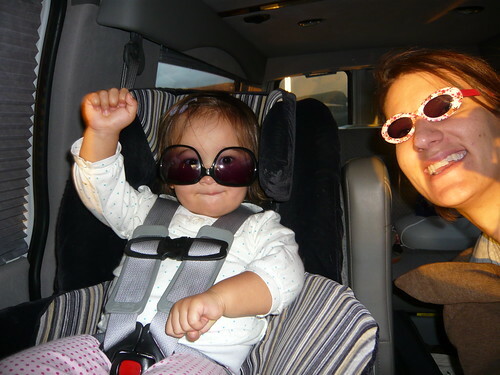 Ava had a blast dancing and lip-syncing to her favorite tunes. On Monday, we hit the road. Instead of taking the winding road back down the hill which would of given me a heart attack since we would of been on the cliff-side, we took the CA-14 through the high desert. Nothing but boring straight roads and lots of cacti. Perfect. It gave me time to breathe normally and play with Ava in the back seat after she woke up from her two hour nap. As our first mini-road trip came to an end, we swapped sunglasses and danced as the sun was setting on the road in front of us.